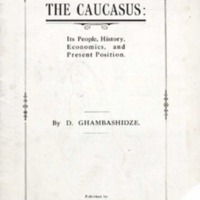 Description: General survey of the Caucasus (especially Georgia) and its inhabitants, as well as the political situation, at the end of the First World War. 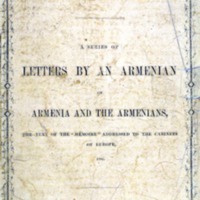 Description: Volume containing a pamphlet translated by the editor, entitled "The Armenians and the Eastern Question"; an address by Armenian residents of London; letters to the Times, written by the editor; letters of the correspondents of the Times at Constantinople and Armenia; and a letter of the Rev. C. G. Curtis, of Constantinople.